Compare the quality of life (QoL), perception of health and its relation in people with and without diabetes. Study comparative sample of 208 people over 40 years, users of the public health system. For QoL, we apply 5 EuroQol-5D dimensions, besides sociodemographic variables, the data were processed with SPSS 11.0 program using Chi2 analysis of variance and odds ratios, taking as a significant P <0.05. 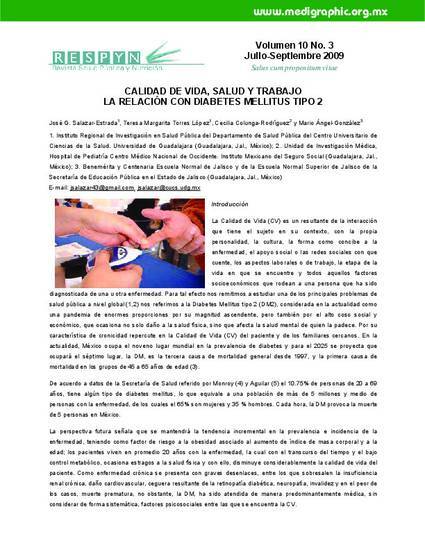 The total sample (238), 61% are women, with an average age of 54.7 ± 6.8 years, 47% devoted to housework, 38% with higher education to primary, 23% without primary and 39% Primary completed, the separation between diabetics and non-diabetics, there were no differences in sociodemographic variables of gender, education and marital status, with the exception of financial compensation (p = 0.002) and this time the average age (0.002). In 5 dimensions and the overall rating of CV, the score was higher for people without diabetes who self rated with a better quality of life, the area most affected in people with diabetes is anxiety / depression (P <0.00). There was a tendency for women with diabetes to qualify higher CV compared with men. People with diabetes are classified as deteriorating quality of life, although there is a favorable trend in women with diabetes who evaluate and improve their quality of life compared to men with diabetes. The most affected dimension is anxiety / depression.